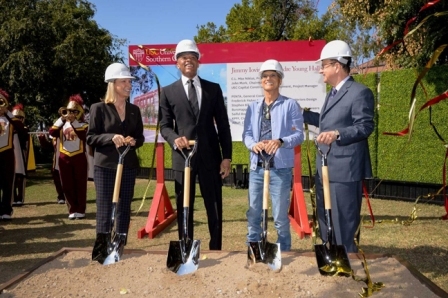 Music legends Jimmy Iovine and Andre Young, also known as Dr. Dre, dug into what will be known as the Iovine and Young Hall, home to the USC Iovine and Young Academy for Arts, Technology and Business. “Today, the Iovine and Young Academy begins a new chapter — breaking ground on the kind of home that its spectacular students deserve,” remarked USC President Max Nikias, addressing a crowd of students, USC staff, donors, and members of the media. What began as a $70 million endowment bestowed upon USC by the music mogul duo in 2013, four years later, has become one of the leading interdisciplinary programs among universities in the United States. Since it opened in fall of 2014, the Iovine and Young Academy has admitted a highly competitive group of 114 undergraduate students, who will receive a bachelor of science degree in arts, technology and the business of innovation. Classes, to this point, have been held in what is referred to as “the Garage”, located atop USC’s Ronald Tutor Campus Center. In 2019, the Jimmy Iovine and Andre “Dr. Dre” Young Hall will officially open at the intersection of Watt Way and Exposition Boulevard. The 10,000 square foot construct will feature: 3D printing and scanning; media labs for photo, video and audio capture and editing; workshops and studios to encourage innovation and the development of startups. “I hope at this school we can help our students to dream big, execute and build the courage to stay in the saddle,” Iovine said. Students like Kimari Brown, a senior game design and business major from North Carolina, appreciates the opportunity. 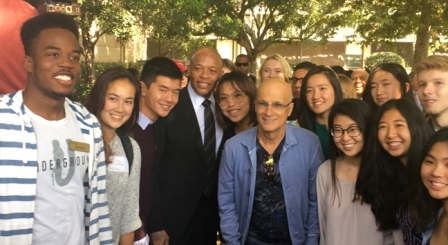 “As a student of color, I’d like to thank Dr. Dre personally for the opportunities that he’s provided [to] myself and other students of color,” said Brown. In Brown’s freshman class of 31 students, African-American students made up 10 percent of the academy. The program’s diversity has been one of the highlights of his time in the program. Upon being accepted to the specialized academy, Brown had specific expectations for his collegiate tenure. Brown has had a myriad of internships, including with the Los Angeles-based radio station, 93.5 KDay, as well as with Innovation Media Productions, among others. Though Brown will not have the fortune of experiencing the new hall, he is looking forward to coming back as an alumni and utilizing the alumni lab as well as witnessing the growth of the academy. “We were kind of like the guinea pigs and it’s been a rollercoaster, but it’s an honor to be the first graduating class and I look forward to it,” said Brown, who is set to walk across the stage with the inaugural graduating class of the Iovine and Young Academy in May 2018. With the newest addition to USC’s campus being a permanent home for the Iovine and Young Academy, students will continue to transform the status quo of the arts landscape, through “inventions and products that will transform our lives,” according to President Nikias.